A few days ago, I put out the list of players that spent time on the disabled list in 2010 along with the some team data. 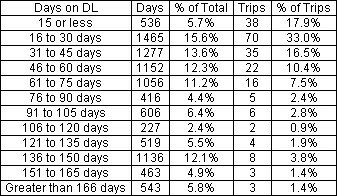 Today, I will look at how the DL data breaks down by position. The only piece of information that jumped off to me was comparing the days lost by pitchers of the Boston Red Sox and the Arizona Diamondbacks. The Diamondbacks, which lost the 4th lowest number of days, lost more days to pitchers than the Red Sox, which had the 3rd highest total of days lost. The main difference I noticed from the numbers is the high percentage of pitchers than spend >165 days on the DL compared to hitters. 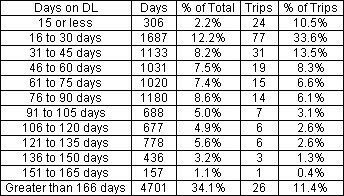 Barely any of the hitters on the DL, 1.4%, are out for an entire year, but 11.4% of the pitchers make the longer stay. For the next installment, I will be breaking down the data by injury type (i.e. strain) or body location (i.e. elbow). We hoped you liked reading 2010 Disabled List: Position Data by Jeff Zimmerman! Will Hamilton’s Ribs Hold Him Back? Not surprising that the two teams with the fewest pitchers lost in the NL (ATL and SFG) had the lowest park-adjusted ERAs in the league. 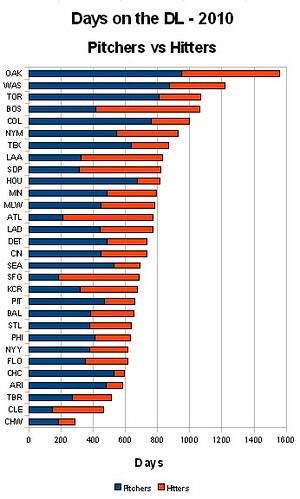 How does injury data correlate with park factors? It doesn’t. Read it again.